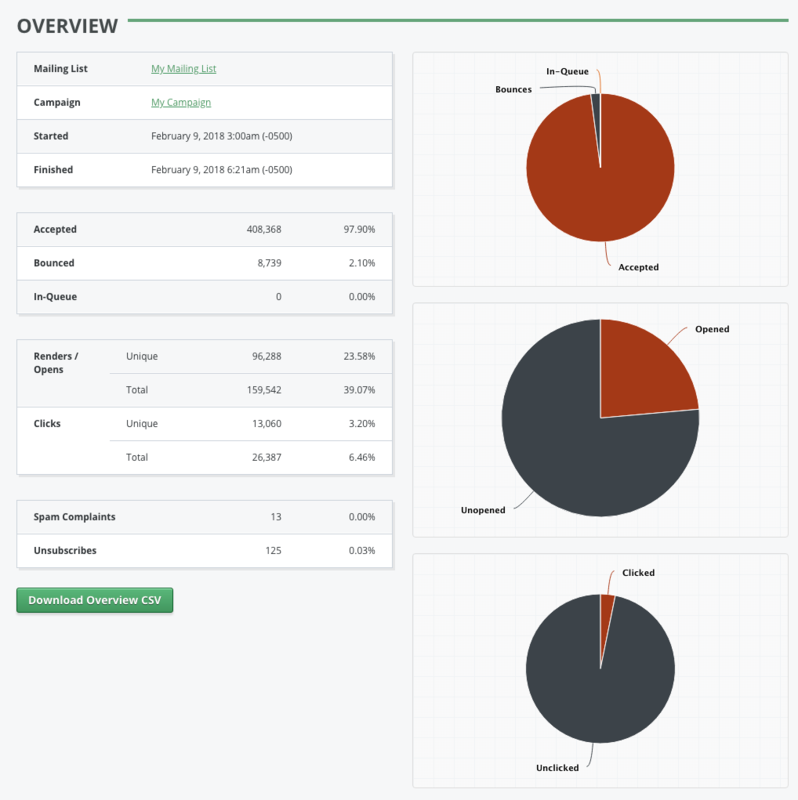 The Campaign Statistics page presents a detailed set of statistics for an individual campaign. The name of the mailing list that this campaign was sent to. The time that the campaign started sending. The time that the campaign’s last message was generated by GreenArrow Studio and handed off to GreenArrow Engine for delivery. Not all messages are delivered to their recipients by this time. 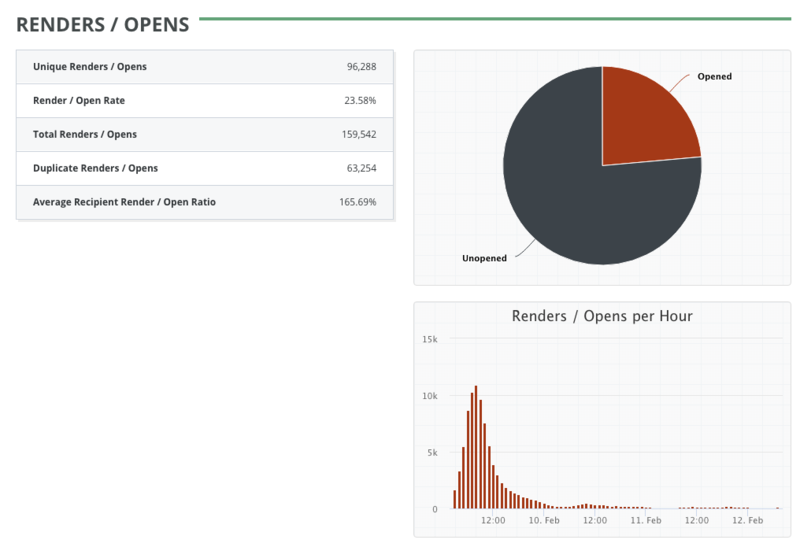 See the Accepted, Bounced and In-Queue figures, which are described next for details. The number of emails accepted by remote servers and not later asynchronously bounced. These messages could ultimately be delivered to either the recipient’s Inbox or Spam folder. 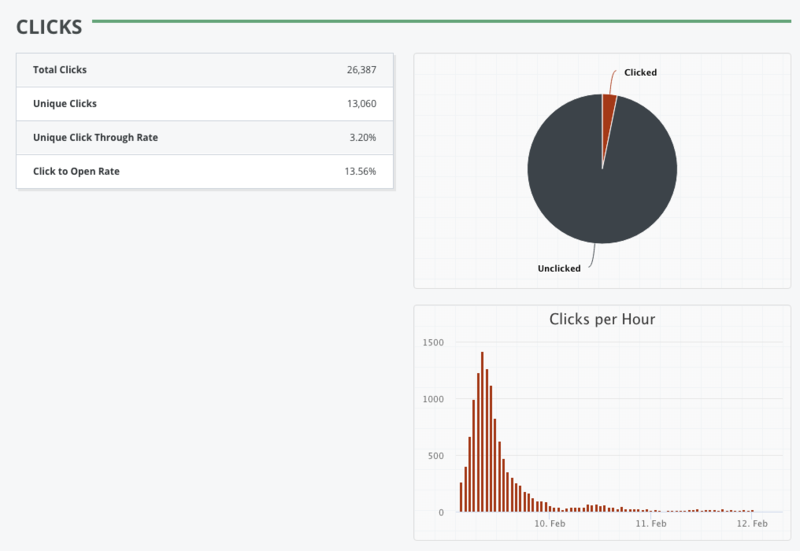 GreenArrow Monitor can be used to estimate what percentage of messages ultimately end up in the Inbox and Spam folders. The number of emails that bounced. This includes both synchronous and asynchronous bounces. 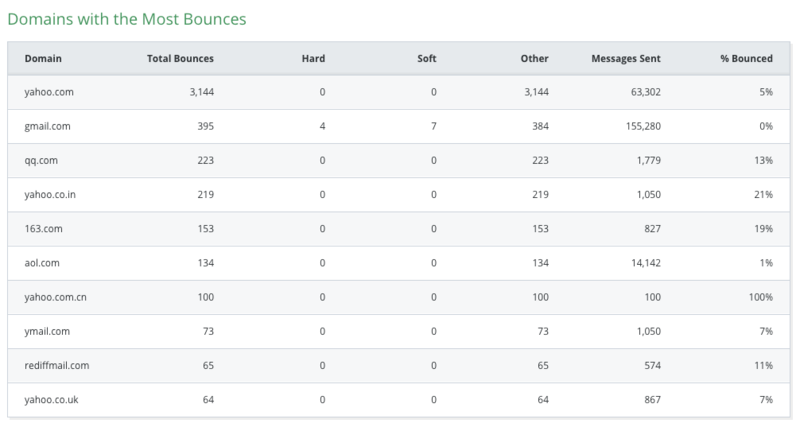 See the Bounce section of the campaign’s stats for details. The number of messages that are still in GreenArrow’s local mail queue, waiting to be delivered. This number includes messages which have had no delivery attempts made yet, as well as messages which had delivery attempts deferred or throttled. The total number of subscribers who loaded the campaign’s images. Each subscriber is only counted once in this figure, regardless of how many times they load images. Subscribers who open the campaign, but do not load images are not counted in this figure. The percentage shown is the percentage of accepted emails which had images loaded at least once. The total number of times that images are loaded for this campaign. If the same subscriber loads images multiple times, each instance gets counted towards the total figure. The percentage shown is the total figure devided by the number of accepted emails. The total number of subscribers who clicked on links. Each subscriber is only counted once in this figure, regardless of how many links they click. The percentage shown is the percentage of accepted emails which had a link clicked at least once. The total number of clicks that took place. If the same subscriber clicks multiple times, each occurrence gets counted. The percentage shown is the total figure devided by the number of accepted emails. The total number of spam complaints that were received. The percentage shown is the total figure devided by the number of accepted emails. The total number of unsubscribes that were received. The percentage shown is the total figure devided by the number of accepted emails. This is the first of a series of “Download” buttons that appear in the report. Each of these buttons links to a CSV file which can be read by applications like Microsoft Excel and LibreOffice Calc. The CSV file that this button links to contains a CSV version of the majority of the stats page that you’re viewing. It omits the information that’s contained in the page’s “History” sections. Each of those “History” sections have “Download” links that you can use if you’d like to download their data as CSV files. The total number of subscribers who loaded the campaign’s images. Each subscriber is only counted once in this figure, regardless of how many times they load images. The percentage of accepted emails which had images loaded at least once. The total number of times that images are loaded for this campaign. If the same subscriber loads images multiple times, each instance gets counted towards the total figure. Total Renders minus Unique Renders. Total Renders divided by Unique Renders. The “Download” link that appears next to the “History” table links to a CSV file containing the table’s data. The total number of clicks that took place. If the same subscriber clicks multiple times, each occurrence gets counted. The total number of subscribers who clicked on links. Each subscriber is only counted once in this figure, regardless of how many links they click. The percentage of accepted emails which where clicked at least once. Unique Clicks divided by Unique Opens. Download a CSV file containing this table’s data. The URL clicked. GreenArrow will display up to the first 50 characters in the table. You can click on the link to visit the original URL. URLs with different query strings, like http://example.com?page=1 and http://example.com?page=2 are separate entries in the table. The total number of subscribers whose first click was this link. All of the “Unique Clicks” figures in this table add up to the number of “Unique Clicks” shown in the previous table for the campaign as a whole. The total number of clicks minus unique clicks. The total number of subscribers who clicked on this link. Each subscriber is only counted once, regardless of how many times they click. The number of unique Hard bounces. The number of unique Soft bounces. The number of unique Other bounces. The percentage of subscribers sent to whose email address bounced. The number of subscribers who will not be sent to again because their status was changed to “Bounced” by the bounce processor. Total bounces minus unique bounces. The number of unique synchronous bounces. A numeric code that GreenArrow assigns to this type of bounce. A brief description of what this category of bounce represents. The Hard/Soft/Other classification for this type of bounce. The number of unique bounces in this category. The percent of unique bounces which are in this category. The domain name being reported on. The total number of bounces that took place at the domain. The number of hard bounces at the domain. The number of soft bounces at the domain. The number of other bounces at the domain. The total number of messages that this campaign sent to the domain. Messages sent divided by total bounces. This table displays a list of individual bounces. The email address that bounced. The Hard/Soft/Other classification of this bounce. The numeric code that GreenArrow assigns to this type of bounce. True if this was the first bounce for this subscriber/campaign combination. False otherwise. True if this was a synchronous bounce. False otherwise. 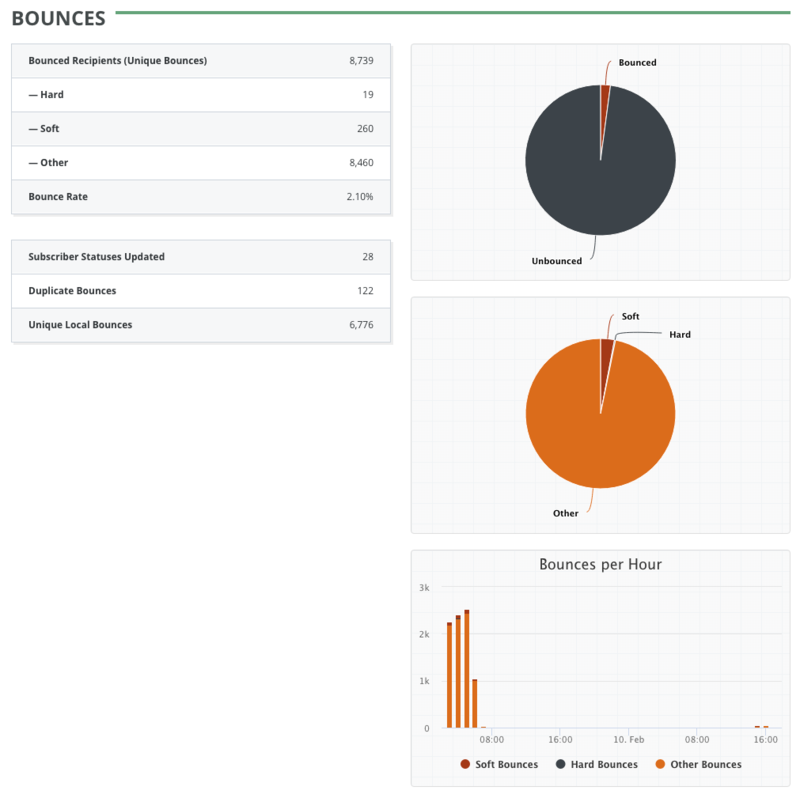 True if the subscriber’s status was changed to “Bounced” as a result of this bounce. The time that the bounce took place. The number of subscribers who triggered spam complaints. Multiple complaints from the same subscriber are only counted once in this figure. The number of subscribers who will not be sent to again because their status was changed to “Spam Complaint” by the spam complaint processor. Total complaints minus unique complaints. The percentage of accepted emails which resulted in at least one spam complaint. The total number of complaints that took place at the domain. Messages Success divided by Complaints. The total number of messages that GreenArrow successfully delivered for this domain to another mail server, and which GreenArrow did not later receive an asynchronous bounce for. The email address that generated the complaint. True if this was the first complaint for this subscriber/campaign combination. False otherwise. True if the subscriber’s status was changed to “Spam Complaint” as a result of this complaint. Normally the value here is “True” unless either the complaint is a duplicate or the subscriber clicked an unsubscribe link before triggering the spam complaint. The time that the complaint was received. The number of subscribers who unsubscribed. Multiple unsubscribes from the same subscriber are only counted once in this figure. The number of subscribers who will not be sent to again because their status was changed to “Unsubscribed”. Total unsubscribes minus unique unsubscribes. The percentage of accepted emails which had an unsubscribe link clicked at least once. The email address that unsubscribed. True if this was the first unsubscribe for this subscriber/campaign combination. False otherwise. True if the subscriber’s status was changed to “Unsubscribed” as a result of this unsubscribe. Normally the value here is “True” unless the unsubscribe is a duplicate or the subscriber unsubscribe from another campaign after they were sent this camapign, but before they clicked its unsubscribe link. The time that the unsubscribe was received.